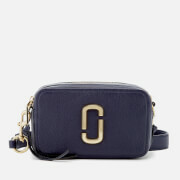 Women’s small cross body bag from Marc Jacobs. Crafted from premium leather, the ‘Shutter’ bag comprises dual compartments with zip top fastenings. Each compartment opens to reveal a spacious, lined interior. Transported using an adjustable shoulder strap that is detachable via Marc Jacobs’ signature gold-tone dog leash clips. The bag is complete with an iconic, leather wrapped, double ‘J’ design to the front, printed branding to the top and a removable leather tassel.